Protect yourself from briars and water! For some of us, hunting has been a way of life for as long as we can remember. Our best memories with friends are created in the wild and wonderful back country. Our goal has always been to craft the toughest hunting gear that will not only survive every hunting trip, but will also inspire you to keep the tradition alive. Briarproof Hunting creates gear for authentic hunters. You trek through thickets and thorns to do your best hunting, and you need equipment that can take a beating. Briarproof Hunting manufactures rugged, durable gear that is made and tested by real hunters. A true hunter knows that quality is affordable, fits well, and lasts for years; and that's what Briarproof Hunting does. What Type Of Hunting Clothes Are You Looking For? Let us help you choose the perfect gear for your hunt by answering a few questions. Dan's Hunting Gear Brand products are made in the USA. A Word From Our Customers..
"During my first hunt with I went through some of the thickest briars you could imagine. I got a couple in the face, but none through the jacket. I love this thing." "These chaps do everything they are suppose to do . If you hunt in heavy brush or just want to stay dry in the field these are it . I am avid rabbit Hunter. I run a pack of five beagle so I m in the field all year long and like the GPS collars I won't go out in the field without them . Best of all they made in the USA." "This was bought as a gift for my son. I like it so much, I am ordering one too. Excellent pocket placement. Plenty of space for the cell phone and dog collar controller. The game pockets are large, and easy to access from the front." "Worth every penny! I wore these for the first time today and was very impressed . Great product for the price. I hunt in the worse bull briars you will every walk through and I never felt one. The suggestion of getting the inseam 2 in. Short was great. Being short most bibs are to long and tear at the bottom. I definitely recommend this product for the serious hunter." Our gear is manufactured by hunters, so we know exactly what it takes to create high-performance hunting gear. We extensively field test our equipment to make sure it satisfies our standards before we put it in the store. All of our gear is made in the USA, and we guarantee your satisfaction or you can bring it back, no questions asked. Briarproof Hunting specializes in good-fitting, durable hunting gear to keep you hunting at a professional level. Get a free copy of the latest Dan's Hunting Gear Catalog. 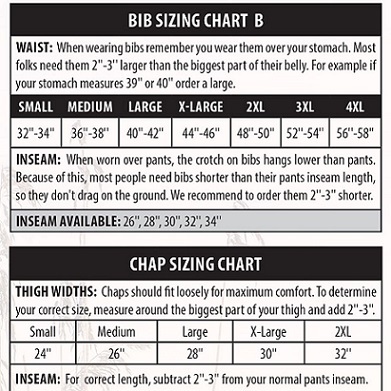 Check out our sizing information before placing your order.